Thanksgiving is officially over and Christmas will be here in just a little over 20 short days! I got busy this past weekend decorating my house for the holiday season and discovered that I did not have anything for my mantle. 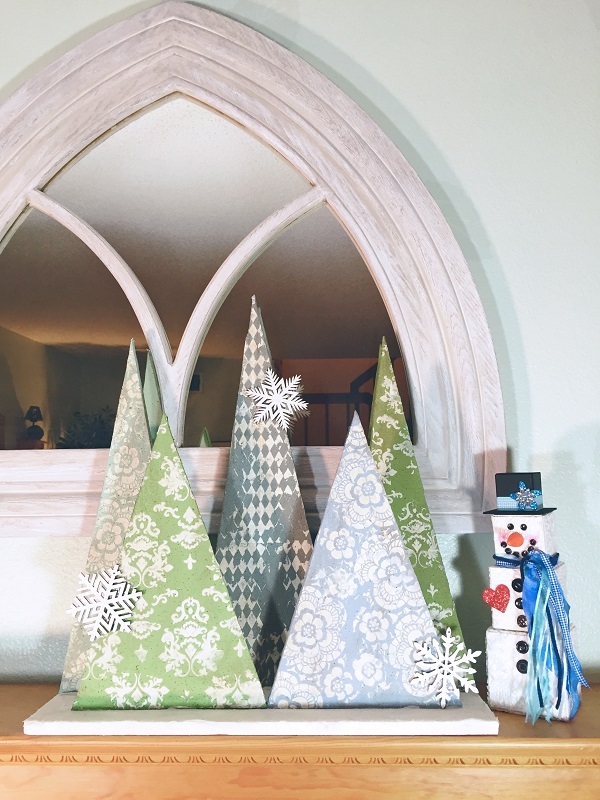 I love Christmas trees, so I created these winter wonderland Christmas trees with some paint, stencils and molding paste. One of the things that I like about Smoothfoam is that it’s easy to cut so you can create a finished piece that looks like a high-end wood decoration that you would buy at a home décor store! Learn how to make this Christmas mantel craft below. 1. Measure the first Smoothfoam sheet to an 18″ by 6″ piece for the base and a 12″ by 8″ piece for a front tree. Cut apart with the hot wire tool. Mark the top center of the smaller piece, then cut a triangle by slicing from the bottom two corners up to the top center mark. 2. Measure and cut the second Smoothfoam sheet into an 18″ by 12″ piece for three back trees and a 12″ by 8″ piece for a front tree. Mark the top center of the larger piece, then mark in 2″ from the bottom at left and right and cut into a triangle. 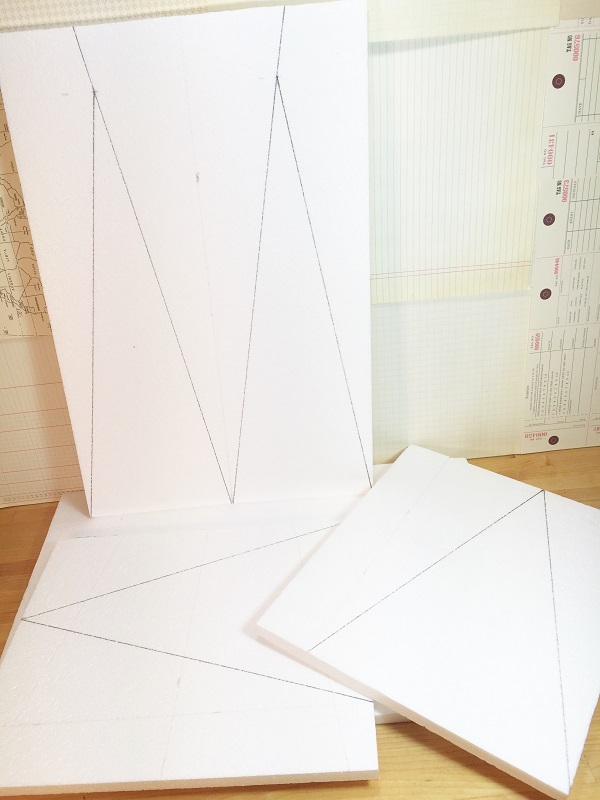 Measure 2″ up from the bottom of the this triangle, then cut from each mark out to the top left and right edges to create two smaller triangles. Cut one last triangle from the remaining piece of the sheet. 3. Paint each triangle tree a different color. Let dry and apply a second coat if desired. 4. Mix cream paint with molding paste and lightly spread the mixture across your stencil with the palette knife on to each painted tree. I used harlequin, lace and damask stencil patterns for a variety. Set aside to dry. 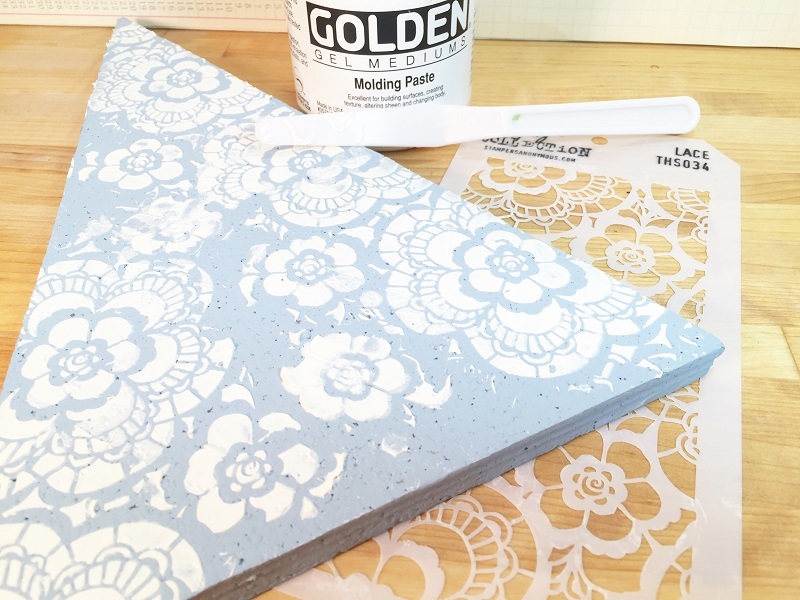 Spread more of the tinted molding paste to the base sheet and sprinkle with clear glitter, then set aside to dry. 5. 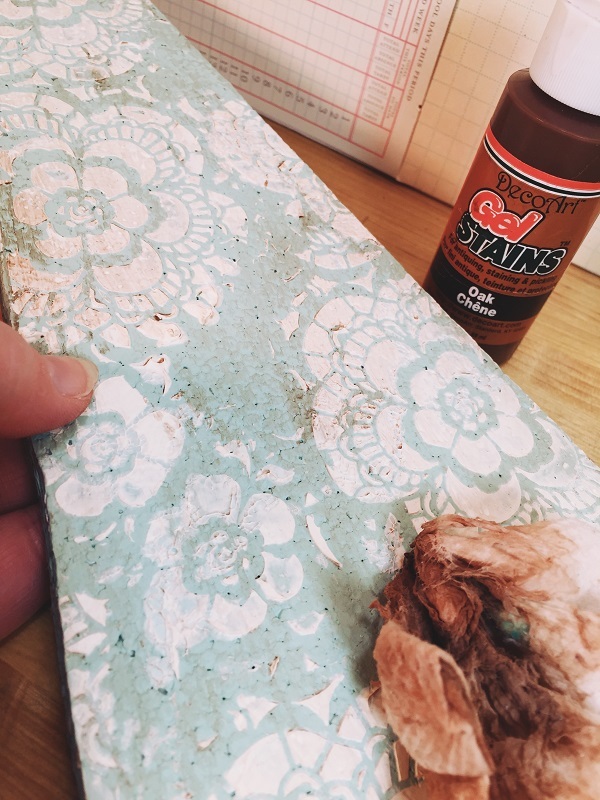 Distress each stenciled tree with the stain by brushing a small amount across the surface then wipe off the excess with a damp paper towel. Leave some areas darker and some areas lighter. 6. Insert two toothpick halves into the bottom of each tree. 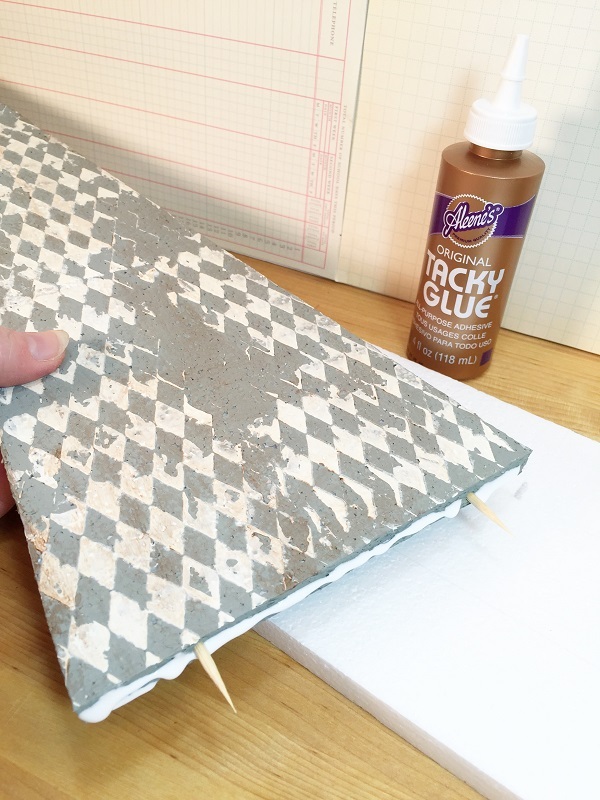 Apply a line of glue to the bottom edge, then insert into the base and push down to set. Repeat with other four trees in position, 3 taller trees in back andd 2 shorter trees in front. Glue wood snowflakes to embellish the trees. Let the glue dry several hours or overnight. Thanks for stopping by and checking out my Winter Wonderland Treescape tutorial! I think I might leave it up all winter long! If you love this Christmas mantel craft, check out the Smoothfoam Facebook page for more inspiration! This entry was posted in Holiday Crafts, Special Techniques and tagged Christmas, Display, Green, Sheet, Tabletop by Beth Watson. Bookmark the permalink.